Will any of your cartridges fit our Lexmark 5400 fax machine. It also has X5470 written on the side of the machine. The machine type model serial number is 03385137535 2006/09. If so, kindly give us the cartridge numbers and prices for black and colour inks? Your sincerely, J.Vialardi. The HP Officejet Pro K5400 is an extremely fast colour desktop printer. Print at 36ppm in black and 35ppm in colour in draft mode or in best quality mode 12ppm and 10ppm repectively. The Officejet Pro K5400 uses a USB 2.0 interface and is excellent for printing sharp text and graphics documents and surprisingly good photos. Our HP Officejet Pro K5400 ink cartridges come in light user or high capacity cartridges and offer exceptional build quality meaning you enjoy reliability, quality and value for money all roled into one. Avoid paying over the odds and pay less for your HP K5400 inks here at Cartridge Save. Is it time you refilled your HP Officejet Pro K5400 printer? Before you do you may want to consider the great savings you make by using our free delivery service. Have you ever thought of what may happen if you purchased a faulty cartridge or that you did not get the quality results you paid for. Well, we dispatch every single printer cartridge with a money back guarantee just to make sure that your purchase of HP Officjet Pro K5400 ink lives up to your expectations. Print with confidence and enjoy the benefits of buying your HP ink cartridges at Cartridge Save. The HP Officejet Pro K5400 is built for businesses, boasting a monthly duty cycle of up to 7500 impressions. It is a single function machine that exceeds expectations when it comes to colour prints, and is suitable for offices with mid- to heavy-volume printing needs. The HP Officejet Pro K5400, however, is quite bulky for a single-function. It is also not the most economical choice as it uses one black and one tri-colour cartridge – an inefficient combination. The HP Officejet Pro K5400 boasts a sleek black and grey finish and measures some 19.5x15x8.1 inches. It has a front-yield paper tray with a capacity of up to 250 sheets. The HP Officejet Pro K5400 can be used with different kinds of print media, including labels, index cards, envelopes, photo paper, and plain paper. There is a lot to love about the HP Officejet Pro K5400. It produces excellent print quality but is affordable. Its 4-colour system yields crisp and vibrant images, and its fast print speeds for black and colour documents increases productivity. The HP Officejet Pro K5400 is a bit bulky for a single-function device. 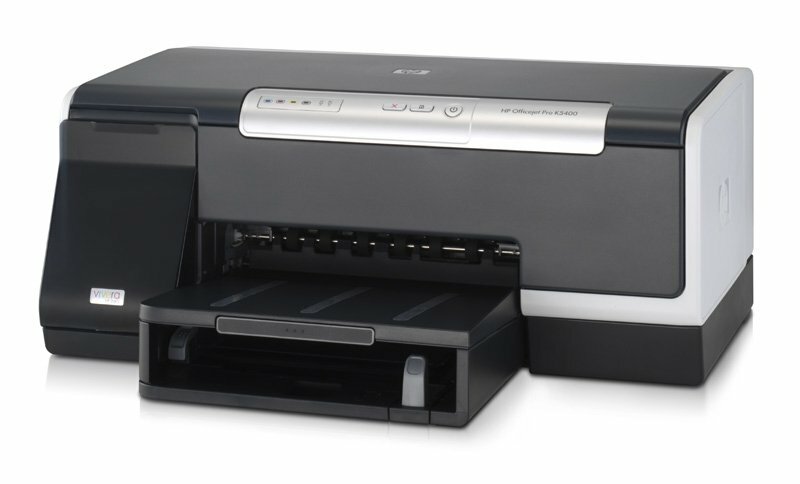 It is also not as versatile as other comparable models which already have wireless connectivity and memory card slots for direct printing. Still, it does score high when it comes to print quality.